Middle-earth Role Playing (MERP) is a 1984 role-playing game based on the writings of J.R.R. Tolkien (specifically The Lord of the Rings and The Hobbit) under license from Tolkien Enterprises. Iron Crown Enterprises (I.C.E.) published the game until they lost the license on 22 September 1999. The rules system of the game is a streamlined version of I.C.E. 's generic fantasy RPG, Rolemaster. Characters possess Attributes and Skills rated between 1 and 100 on a percentile die (d100) or two ten-sided dice (2d10). Skills can be modified to a rating above or below these limits (i.e. under 1 or over 100, with open-ended merp options to add or subtract additional d100). An attack roll consists of a percentile roll, to which the attacker's skill rating and appropriate attribute rating are added and the defender's dodge rating is subtracted. The result is compared to the defender's armor type and looked up on a table to determine success or failure. A separate critical table is used if the initial chart result called for it. MERP was generally well received, although not recommended for beginners. Some commentators[who?] disliked how the system handled magic. In Tolkien's books, magic is a rare, subtle force only used by a few powerful characters, whereas in MERP, magic (from healing to throwing thunderbolts) was possible for nearly any high level player characters. This lack of continuity with the source material was seen to upset the game's authenticity. However, in many early reviews the game play was described as being true to the spirit of Tolkien's work and a pleasure to play. William A. Barton reviewed Middle-earth Role Playing in Space Gamer No. 73. Barton commented that "If you haven't yet taken a trip to Middle-earth via the Iron Crown, I recommend you remedy the situation as soon as possible." Middle-earth Role Playing was ranked 11th in the 1996 reader poll of Arcane magazine to determine the 50 most popular roleplaying games of all time. The UK magazine's editor Paul Pettengale commented: "The popularity of the books, we would suggest, explains why the game based on Tolkien's world is so popular. For the system is overly complicated (being based on the complex Rolemaster system - see number 15), and it suffers from the problem of timing. For example, in which time do you set your campaign? Set it before The Lord of the Rings and everyone knows what's going to happen, set it after The Lord of the Rings and you've got to make a whole load of stuff up. Still, the supplements are all good, if you get off on bucketfuls of detail and polished prose. Not for everyone, sure, but die-hard Tolkien fans should check it out." The game's early editions were later printed in many countries, including Brazil, Argentina, Spain and France. I.C.E. 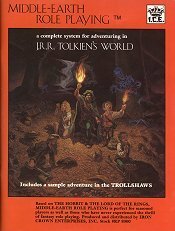 published a First and a Second Edition of the MERP ruleset, and was working on the third edition that was not published, along with many adventure and campaign modules, until Tolkien Enterprises revoked the license for games based on The Hobbit and The Lord of the Rings in 1999. I.C.E. subsequently declared bankruptcy in 2000. A related quarterly magazine, Other Hands Magazine created by Professor Chris Seeman, supporting the MERP community, was also sent a cease and desist by Tolkien Enterprises, and ceased publication in 2001. A magazine named Other Minds Magazine created by Hawke Robinson, (named in recognition of the previous Other Hands quarterly, both in reference to a quote from J.R.R. Tolkien's Letters) began publication in 2007, it also supports the role-playing community using ICE's MERP, Decipher's LotR, Cubicle 7's The One Ring (TOR) RPG, and other Tolkien-centric role playing game systems. In 1991-1993, I.C.E. also published the Lord of the Rings Adventure Game. It used a much simpler system than MERP and was intended to introduce new players to role-playing. A UK edition was published by Games Workshop in 1985. It featured the First Edition rules, with new box and booklet art by Chris Achilleos, along with 25mm floorplans for the sample adventure. In Sweden a translated version called Sagan om Ringen: Rollspelet was released in 1986 by Target Games, followed by several translated modules. A Finnish language edition (Keski-Maa Roolipeli or KERP) was published in 1990. In the Summer of 2005 a new annual convention began known as Merpcon (Middle-earth Role Playing Convention). It initially used the ICE MERP and ICE Rolemaster role playing game systems. ^ Sutherland, Jonathan (February 1984). "Open Box: Lord of the Rings". White Dwarf (review). Games Workshop (50): 12–13. ^ Vasey, Charles (February 1984). "Counterpoint: Fellowship of the Ring". White Dwarf (review). Games Workshop (50): 33. ^ a b Barton, William A. (Mar–Apr 1985). "I.C.E. 's Middle-earth Modules". Space Gamer. Steve Jackson Games (73): 6. ^ "Archived copy". Archived from the original on 2013-04-16. Retrieved 2012-11-28. CS1 maint: Archived copy as title (link) Chris Seeman, ICE MERP series editor Second Edition and Third Edition, MerpCon 2005 speech, and MerpCon 2007 speech, explaining versions.